How To Get Etisalat 1GB For Just #200. HomeFree Browsing CheatHow To Get Etisalat 1GB For Just #200. 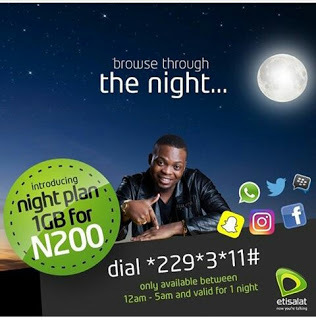 Etisalat currently offers you 1GB for N200 Night plan which you can use from 12am: to 5am. Look at it from this angle, Airtel gives you 1.5GB for N50, MTN gives you 500MB for N25, and now Etisalat gives you 1GB for N200. Even if you hate data, which plan will you go for?